Why is the Obama campaign so confident when the national polls seem so close? Perhaps their polls show Obama with a larger lead? Maybe they’re convinced that the likely voter models are too tight, or otherwise under-represent non-white and young voters (cell phones?). But the Obama campaign’s persistent advantage in the state-level polling—and therefore the Electoral College—is another possibility, especially since the campaigns invest far more in state than national polls. Whatever you think of that argument, it’s clear that the Obama campaign was putting its money where its mouth was. They weren’t spending on advertisements in potentially competitive states like Wisconsin, Michigan, or Pennsylvania, even as Romney-aligned super PACs spent millions on an uncontested advertising campaign. Boston wasn’t spending money on those states either, but the limits on their ability to spend general election dollars before accepting the nomination at the RNC constituted a reasonable excuse. But the conventions are over, Romney is out of excuses, and the Romney campaign’s first post-convention ad buy covered familiar territory—the eight mutual battleground states—and nothing more. Not even Wisconsin, where the polls showed a very tight race in mid-August after Romney selected a Wisconsin-ite, including two polls showing Romney with a slight lead. The news comes just after reports that Romney-aligned super PACs have dropped their advertisements in Michigan and Pennsylvania. Romney still has time to put up advertisements in Wisconsin (or perhaps Pennsylvania or Michigan, although that seems less likely), but it would be surprising if they decided to concede the state. Is there a plausible explanation? Sure. Maybe the internal polls show Obama with a comfortable lead. I suppose Boston could be convinced that the Ryan bounce is ephemeral and that Obama will return to the comfortable advantage he enjoyed prior to the Ryan selection. Remember that Obama had a clear lead among recall voters in a Republican-friendly electorate. 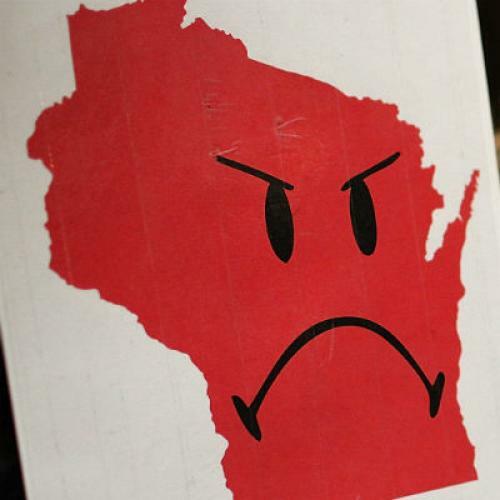 But given Romney’s overflowing coffers, his desperate need for the Badger State’s 10 electoral votes, and its favorable demographics, it would strike me as a little bizarre if they didn't vigorously contest the state. If Romney can’t put Wisconsin firmly into the toss-up column, his electoral map gets tenuous. The uncontested states plus Wisconsin provide Obama with a 247-191 lead in the electoral college. At the moment, it’s hard to say that Romney has a discernible edge in any battleground state other than North Carolina, which would get him to 206 electoral votes. But Obama has an even clearer edge in New Hampshire and Nevada than Romney does in North Carolina, where Obama is near 50 percent and not one poll has shown Romney in the lead since he secured the nomination. At that point, Florida, Virginia, Ohio, or Colorado plus Iowa would provide four independent routes for Obama to make the leap from 257 electoral votes, and, at this stage, none of those routes seems implausible. Romney would need to block all of them. Putting Wisconsin back in the toss-up column would give Romney more options. A Romney win in Wisconsin would require Obama to win an additional state beyond Ohio. Wisconsin could even block Obama victories in both Virginia and Colorado. Wisconsin could even deny Obama a victory if he won Florida, although it would require the somewhat preposterous scenario where Romney won each of the eight other battleground states. So the Obama campaign's confidence might just be a matter of electoral arithmetic. If their internal numbers are reminiscent of the state polls conducted over the summer, they would have every reason to be optimistic about their chances. And if Romney is staying out of Wisconsin, it would be a good sign that the Obama team wasn't in fantasy land. A 247-191 lead is as good for Obama as it sounds.